London based, Japanese four piece, Bo Ningen are set to release their eagerly awaited new album on Stolen Recordings on the 8th of October 2012. ‘Line The Wall’, the follow up to 2010’s eponymously titled debut, was self produced and recorded at London’s Lynchmob Studios and features ten brand new tracks. Regarded by many as London’s best live band, Bo Ningen have taken huge and exciting strides with this album. They’ve introduced elements that expand the structure and alter the sense of time and space in their music. In previous recordings they focused on capturing the live, raw feeling of the songs but now they’ve added musical layers giving further depth and texture. The tracks are still recorded live with the amps turned up really loud to keep the band’s unique intensity, but there is a shift in composition that gives the new material more possibilities with live dub mix, layers of overdubs and synth-processed guitar and drums. Bo Ningen have used the production as a part of the composition process, playing the song live, experimenting in the live atmosphere to carve, sharpen, and re-compose and the result is one of the most explosive and exhilarating albums of the year. The Bo Ningen line up of Taigen (Vocal/Bass) / Kohhei (guitar) / Yuki (guitar) / Mon-chan (Drums) formed in 2007, but didn’t release their debut EP ‘Koroshitai Kimochi’ on limited edition 10” vinyl until January 2010. Over the last two years they’ve collaborated with artists Tim Noble & Sue Webster and toured throughout the UK, Europe and Japan with bands such as Keiji Haino, Merzbow, Guitar Wolf, Toy and most recently The Horrors. Although Influenced by the ingenious repetition of kraut-rock and the black hole of angst and abandon at the heart of grunge, they are also something of a unique proposition. As well as lying at the intersection of psychedelic experimentation and cult indie guitar music, they bisect East and West, working in a medium that is the product of a much larger, historic moment of cultural exchange; they are a hybrid within a hybrid. The band set off on a tour of Japan in July before returning to the UK to play at the 1234 Festival and Bestival Branchage Film Festival in September. 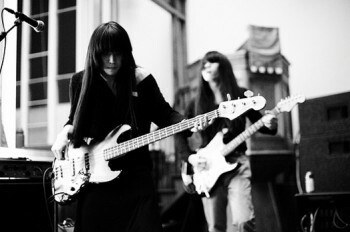 Bo Ningen then head out on an extensive UK headline tour in October to coincide with the album release.